Penzu is the ideal place to keep your online diary or personal journal. Your diary is priceless. Keep it safe with Penzu. • Find an entry from years ago? • Keep it safe from being lost or damaged? • Add your digital photos? • Stop others from reading your personal thoughts and writings? • Keep writing when the pages run out? While we acknowledge the artistic aspect of offline diaries, there is no question that Penzu is the best online alternative. And for those die-hard diary writers, keeping a diary online allows for benefits far beyond writing on paper. If you are still keeping an offline, paper-bound, old school diary, it’s time for a change. And if you are keeping your diary with a blog service or dated online diary site, Penzu is the way to go. Penzu combines privacy, ease of use, and the latest technologies to make for a seamless and unique diary writing experience. There is no long sign-up process, no waiting to write your thoughts down. It is the next best thing to writing on paper with all the benefits of the web. The aim of Penzu is to create an online diary experience that is as similar to writing in a paper-bound journal or diary as possible. While Penzu doesn't offer free-form drawing, it is ideal for writing. And since it is online, there are many benefits to using Penzu rather than paper. Your thoughts are yours, and keeping them in a paper-bound diary isn't safe! Anyone who finds your diary can read it. Your entries are only accessible through your password protected Penzu account. You can go even further and add another password to specific entries and 'lock' them. Sign up for a Penzu Pro account, and get the ultimate security of encryption locking where each locked entry is encrypted using an 256-bit AES algorithm, the same protection used by the United Sates Government. Your entries are so safe, that if you forget the password, they are gone forever! Read more about privacy here. Keeping your diary with Penzu means it can never be stolen or lost. You don't have to worry about leaving your diary behind, or someone stealing it from your hiding place. With Penzu your most precious memories are safe! Have you been away from your diary and wanted to record something at that moment? Penzu is accessible from any computer in the world - take your diary with you wherever you go! Have you every wanted to share just one page of your diary with someone? Now you can. Share your entries via email to family and friends. If you want, you can remain anonymous and the recipient will not know it was you sending the message! 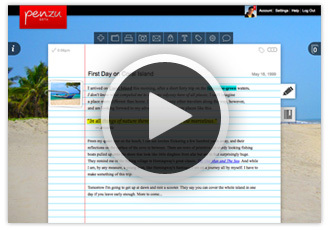 Similar to writing on paper, as you type an entry, it saves automatically! Your thoughts are saved as you go. Have a thought that you need to get out right away? You can start writing on the pad even without being logged in! And once you log in, your entry will be saved to your account. If you find yourself constantly leafing through your diary to find a specific entry, your troubles end here. Penzu allows you to easily search your entries and then sort them by Name, Date Created, Size, Locked, or Shared. You can find past entries in seconds and even edit them if need be! Anything will do! The act of writing is extremely therapeutic, especially when writing about thoughts you don't share with others. Read more about the health benefits of keeping a diary here. Is There Only One Type Of Diary? A diary can be anything you want it to be. You can write whatever comes to your mind whenever you want. For those that don't know what to write in their diary or how, below are some common diary types to get you started. A daily diary usually consists of your day-to-day events and your feelings or thoughts surrounding them. While it may include expressive writing, a daily diary mentions happenings on an ongoing basis. With Penzu your diary is secret by default. But if you want to share entries with friends, go for it! Keeping a diary is a great way to archive your life. You can easily look back on your life and read what you were thinking at a specific moment in time. Famous diarists such as Anne Frank and Che Guevara would not be known if they didn't keep a diary. An expressive diary is one where you write about your deepest thoughts and release your emotions. It can be written whenever and however you want. An expressive diary is usually extremely personal and kept private, but it can be shared at will. Penzu allows you to share your entries anonymously - so if you do want to share your thoughts with someone, but don't want them to know it was you, simply click "share as anonymous" in the share drop-down menu. Writing expressively can have a tremendously positive effect on your life. Read more about the health benefits of keeping a diary here. 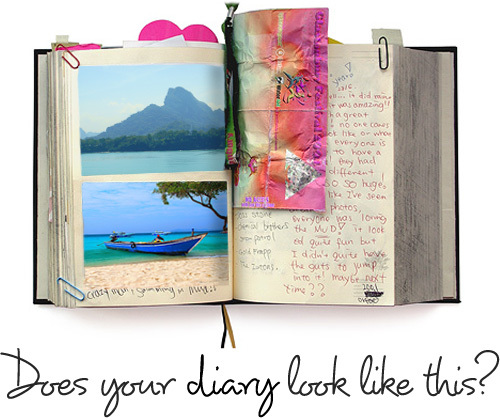 Have you ever thought about a previous trip you took and wished you had kept a travel diary? Similar to a daily journal or diary, a travel diary records the day-to-day of your trip or vacation. We often have heightened experiences when traveling abroad, and keeping a diary is a great way to cherish those memories. Insert pictures and share your travels with your friends! If you have been searching for a place to keep your ideas online and in a secure and private place, your search is over. Penzu is great for notes and ideas about anything at all. Keep your ideas all to yourself, or share them with friends. If you have ever woken up and scrambled to find a pen and paper to write down a vivid dream, a dream journal is a great way to record your dreams. Looking back on your dreams is easy when they are searchable and in one place! Keeping a record of what you eat throughout the day is a great way to track your eating habits. It also has been proven to help decrease weight-loss when coupled with a diet and exercise regime. Learn more here. Kurt Cobain Legendary Nirvana front-man, who kept a personal diary from 1980 until his suicide in 1994. Anne Frank Kept her now famous diary while hiding during the Nazi occupation of The Netherlands. Andy Warhol American pop-art icon religiously kept a diary about his life and conversations with friends. When and How to Write Finding the right time and place for you to write in your diary is an important part of the process.